I'm back. From the brink of death. Not really. Not even close, really. But it sorta felt like it. Let's play a game. It's called "I was so sick that..." I was so sick that I missed the *entire* record-breaking cold front that happened in the South. As in, it was 55° last Wednesday before I got sick, the wind chill got down to ZERO degrees while I was sick, but when I walked outside for the first time again, lo and behold... 55°. (thankfully) I was so sick that when I did that whole walking outside again for the first time, I realized our Christmas wreath was still up. It was the 12th. That is not good. I was so sick that I watched Noelle figure out the pertinent difference between crawling backward and crawling forward... from the couch. (That one was a bit painful.) I was so sick that I learned that 30-something is not too old to have your Mom & Dad come take care of you. And do that whole magic-thermometer-hand-to-the-forehead thingy. (Funny story... my dad and I had a battle of the magic-thermometer-hands. His said I had a fever. Mine did not. Mine is obviously more accurate because I have 3 children and he only has 2.) I was so sick that I did not make anything for 9 complete days. Thank goodness that's over. Whew. Honestly, sitting back down to work after so long was daunting. Scary, even. It seemed I had lost every ounce of creativity that I ever possessed. Seriously. A small freak out *may* have ensued. Luckily, my mom rescued me again and took some (meaning all) of my lovely (meaning mischevious) children off of my hands so I could dig myself out of the giant hole I was in. And my friends rescued me again by praying for me and for the return of some semblance of creativity. Seriously. (Because there's nothin' like complete and utter helplessness to help me remember where my Help comes from.) 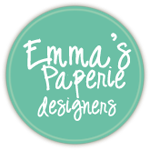 And now I get to show you what I was (happily) able to make for January's Papertrey Ink release. Sigh. It's good to make again. If you have read this post or this post, then you know of my love of the name Noelle and, hence, the phrase "Joyeux Noel." So it should come as no surprise that upon seeing that phrase in the Daily Designs Sentiments set, I immediately set to making a holiday card in January. Cause it's never too early to start on the 2010 Christmas card design, right? I went for a clean and simple look for this one. 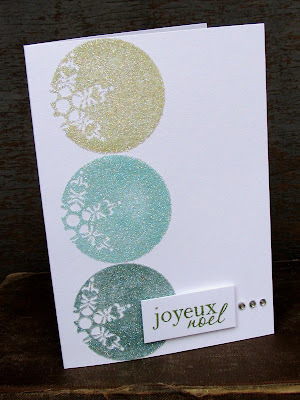 Glittering the circles is a simple way to take a quick and easy holiday card to the next level and give it a bit of pow. 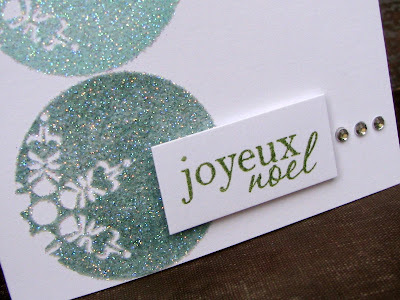 I stamped the snowflake circle (Spring Moss, Aqua Mist, and Ocean Tides), then stamped them again in VersaMark and used some adhesive embossing powder (Heat & Stick powder by Stampin Up) to adhere the glitter. I actually did not have to use VersaMark on the Aqua Mist because I have the new formula ink in that color (by the way, it's awesome!) so the embossing powder stuck right to it. Nifty. Ok, this next one is a bit wacky. I totally had to do it, though. See the sentiment? The sweet scent of powder? It spoke to me. And it said "You should totally try using sprinkling that adhesive embossing powder with baby powder and see what happens!" I stamped it in Fresh Snow and just sprinkled the Heat & Stick right onto the image. Heated it, sprinkled it with the good ol' Johnson's Baby Powder, and voila! A sweet baby card with the actual sweet scent of powder. It ends up with an embossed look, but matte instead of shiny. I'm diggin' it. Since it's a bit of a funky technique, I decided to go a bit funky with the card as opposed to traditional. I paired the sentiment from Inside & Out: Baby with another circle image from Daily Designs and a few images from Polka Dot Basics II. I went a little funky with the colors, too (Kraft, Raspberry Fizz, New Leaf, and Aqua Mist) and did something a bit different with the ribbon. Fun stuff. LOVE these 4 cards Jess! Great job! Oh sigh the tree did me in! I am so glad you are on the mend. Being sick is so not fun! You cards are FAB! Did I mention sigh? on the tree card...even my 2 year old pointed at it and said "like!" I am so glad you're feeling better! And I'd have to agree with you that you're never too old to have your own mommy and daddy take care of you. And your tree card? Made me put Through the Trees right on my wish list! I thought maybe I could do without it, or at least wait until I saw the whole set to actually decide...but that FABU tree decided for me. It's on my list and I'll be gettin' it!! I am so glad you are feeling better. It really makes you lean on the Lord when that's all you can do, doesn't it!! I *love* the button tree card - and if it makes you feel better, my Christmas tree and lights are still up. Not because I've been sick... just too busy to turn around!! :-) Get some rest and don't overdo it!! Ok, not only are you freaking hilarious, my lil cuppa funny in the morning...you have totally rocked this PTI release! Goodness me, you rock! I am glad you are feeling better. Your cards are WONDERFUL!!! I 'love' your funky button tree!! SO glad you are feeling better and that you have family nearby to help... I am fairly certain that my magic-thermometer-hands (love it!) don't work... but I only have two kiddos too! 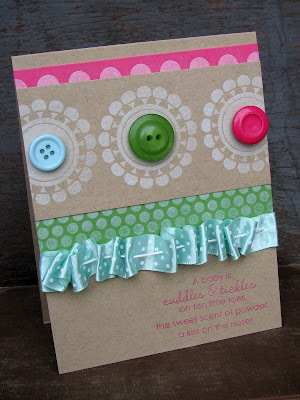 :) LOVE that button tree card! 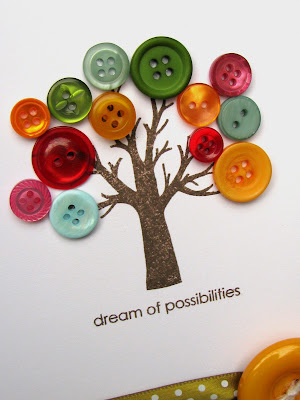 Absolutely love your button tree - it WOWed me!!! Glad to read that you are feeling so much better. Love the cards you showed today. My favorite is the button tree! wow--glad you are back:) Great cards...as always! Welcome back -- glad you are feeling better! 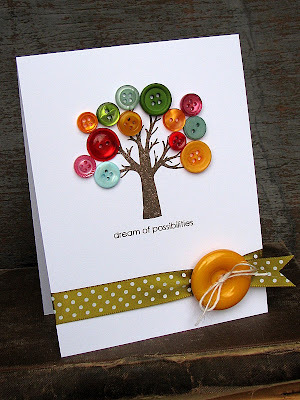 I looooooove the button tree cards. All these cards are AMAZING!! I love the glittery Noel card and the tree cards the best, but I gotta say the baby powder is brilliant! I'm happy that you are feeling better. I just LOVE your button tree. It's adorable. Glad you're feeling better! 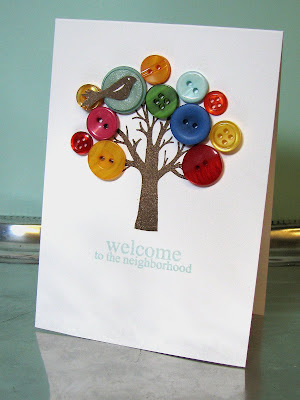 Love your tree/button cards-so cute! 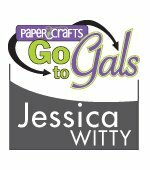 Lovely projects Jess! So glad you are feeling better! And oh my that button tree is amazing!!! I can't wait to try it out myself!! Would it creep you out if I told you I feel like we could be best friends? You are hilarious! I love your cards, but I love your commentary more... it's straight out of my brain. Glad you're feeling better. You don't realize just how much you do until you are down for a few days. The cards are awesome....you sure have your mojo back! Love the baby powder trick! Wanted to know how you double stamp (first stamping in ink and then with heat and stick powder)? 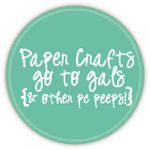 Even though I use clear stamps, I don't always get it perfectly....please share your secret! 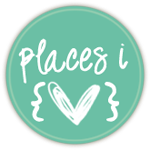 So glad you are feeling better... LOVE your projects, especially the button tree.. it's so cool! Glad you're feeling better. Your projects are beautiful. I agree - this is a great Papertrey release month -but then they always are. I'm mostly commenting today to say I love your posts. You must have a wonderful sense of humor because it comes shining through in what you write. Have a great day being back among the living. Your creativity, hidden in the corner just waiting for you to feel better, certainly came out full force. Your cards are enchanting. And the baby powder idea is magical. You don't even have to scratch to be able to sniff. Glad you're feeling better. Glad you are feeling better and back to creating. Your cards are fabuluous! Can't wait to try the baby powder idea! Nice job! Especially amazing considering how sick you were. Your projects are all beautiful and i am sure will be cased by many. Obviously your creativity came back full force. Thanks for the idea of the baby powder, have 4 co-workers who are expecting so lots of baby card making is in my future. Charming cards! Their really great, love the scented card, does it get any cooler? *Wow*, that tree card is *amazing*!! I really try my hardest to not CASE other people's work but I feel I may have to CASE this one. Stunning Jess, truly stunning!! 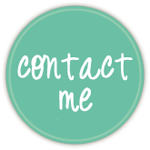 And just wanted to say I know exactly how you feel - I've been ill for over a week now and just feel totally 'bleuch' and not able to make anything! Really hope I'm over it soon as there are still so many sets from my previous order that want to be played with, and they arrived over a week ago! Great cards! So glad you're feeling better, and that your back from the brink of death! glad to hear you're feeling better! Love the tree of possibilities!! I love the first Through the Trees card -- it is what drew me here from Nicole's blog! And .. I found I love you other cards as well! I didn't buy Through the trees on release night because I already own a similar stamp, but when I saw those buttons on your tree, I knew I had to have it. The one I own doesn't look good with buttons. Thanks for such a new interesting idea. Your balloon tree reminds me of the story Balloon Tree - one of my favourites! It's adorable.